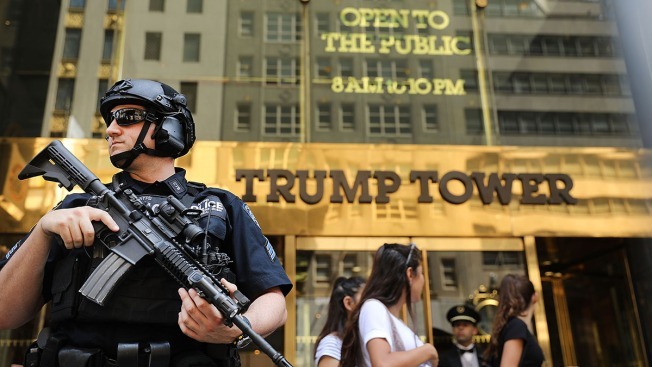 FILE - Police stand guard outside of Trump Tower on Aug. 4, 2017, in New York City. Two holiday parties the Trump Organization held in the atrium of Trump Tower this month may be the latest cases of the first family flouting a rule requiring it to get permission to use what has been designated a public space. New York City's planning department told The Associated Press it has no record of President Donald Trump's company requesting to use the atrium for the parties held Dec. 4 and 12. Such permission is required for private events under a deal Trump struck with the city in the late 1970s. In return for a variance to make the tower bigger, the building's grand marble lobby must be open to the public every day from 8 a.m. to 10 p.m.
"Tis the Season of the Trump Organization Christmas Party!" the company tweeted this week, with pictures showing well-dressed guests sipping drinks and noshing on sushi under a decorated tree. Donald Trump Jr. and his brother Eric are seen in one shot addressing guests over microphones. An earlier tweet showed similar photos of the Trump Realty holiday party, with an even bigger throng of guests packing the amber-hued lobby. The Trump Organization did not reply to requests for comment. The Secret Service sometimes blocks public access to the atrium to protect the first family, and it's not clear if the agency played a role in the decisions to close the space. It did not immediately return a call for comment. But even if the Secret Service was responsible for the closure, the company still violated its deal with the city, said Jerold Kayden, a professor of urban planning at Harvard. He said the city requires not just written permission prior to private events, but that the events have some public purpose or "extraordinary worthy cause," such as raising money for a charity. "This is a private party for the Trump Organization," said Kayden, who has fought the company previously on public use of the space. "Hold it somewhere else. You can't use that space." Kayden said the city allowed the Trump Organization to add nearly 100,000 extra square feet to the building, which has both office and residential areas. That is about 30 condominiums of extra space, worth about $280 million at current sale prices. Last year, the AP reported that then-candidate Trump held four news conferences in the Trump Tower lobby, and the city could find no prior approval. The city has occasionally cracked down on Trump's company. It was fined $4,000 in 2015 and $2,500 in 2006 for installing kiosks selling merchandise in the space. An audit this year from City Comptroller Scott Stringer found that the Trump Organization is hardly alone. It inspected all 333 of the city's privately owned public spaces and found the majority of them are breaking the rules.